You’re in the middle of the crush right now, I know — but I wanted to make SURE that you utilized these two direct mail campaigns, because no matter what kind of tax firm you operate (i.e. whatever profile your target client falls under), you really should be implementing two specific direct mail campaigns in the next couple months. The best thing about these is that the vast majority of your competitors won’t do them. Either laziness, ignorance, or a sweet little combination of both! 1) The Lost Client Winback Campaign. I have beaten this horse for years, and I’m doing so again … because it’s so darn profitable. Essentially, you mine your database for non-returning clients from LAST year (this is NOT for people who have not yet come to see you this tax season) — and go back the past 2-4 tax seasons. We usually did it for three years back, and it consistently pulled in GREAT numbers for us. The key ingredients are that you A) acknowledge that they didn’t come in last year and B) give them a big incentive for their return this year. The style should be conversational and warm. This is one of the 12+ campaigns available within the NewTaxClientsNow package we provide, but I’m happy to send it right to you personally. Simply shoot me an email (nate(AT)taxpromarketer.com, which goes right to me), and I’ll send you the file in a Word document. You can make any adjustments you’d like, but I urge you to not mess with it too much. It’s a proven winner. They’re really out there … the ones who are sort of ignoring the “tax thing” until mid-late March. And it’s a GREAT idea to speak directly to them. This is another one that did great ROI for us — and that’s really good news for you because back when we did this, we would have to invest about $0.75 a piece with list rental, mailing, printing and handling services combined. Imagine what you could do with a much less expensive direct mail provider? You can easily set up the campaign that I have set up for you right there — for less than half the price per piece that I had to pay a few years ago when doing this for our tax business and when we got 3-10:1 ROI depending on the market area. You have some lead time on this one — ideal “drop dates” are in the first week of April, MAYBE the last week of March, but no sooner. Setting up your campaign requires a couple weeks of lead time on our site there (though the process itself is super easy and quick). But there are a few other great campaigns on there which I have personally set up for you; some multi-step ones as well — in addition to some more generic “industry standard type campaigns which aren’t perhaps as strong, IMO, but some people prefer them. If you are wanting to bring completely fresh clients in the door, there’s no better, more efficient method than demographically-targeted direct mail. Especially when it’s so inexpensive! And do yourself a favor and check out the other campaigns there while you can. And if you’d like that “Lost Client Winback” campaign, shoot me an email at the address cited earlier in the post. You’ll have to set up the list (they’re your former clients, after all), the printing and the mailing yourself, but it’s well worth the effort. 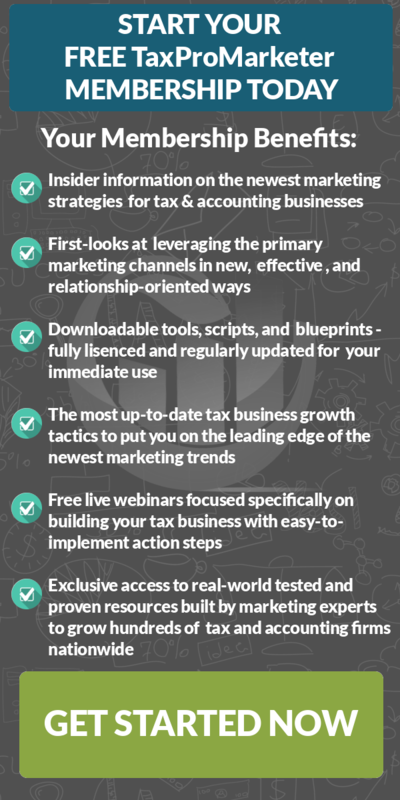 I hope your tax season is going great, and these two resources will just put some more fuel on your fire!